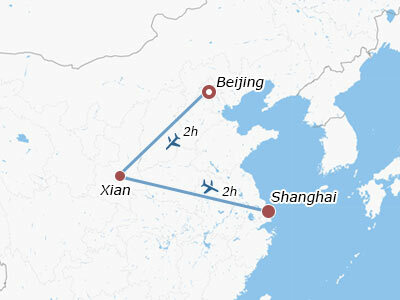 Your 8-day China small group tour starts the moment you land at Beijing Capital International Airport (PEK). You will meet our professional guide outside the customs and then be transferred to the hotel by a comfortable drive. Take the rest of the day to recover from the jet lag. After breakfast, our guide and driver will come and meet you at the hotel lobby and take you to Tiananmen Square. 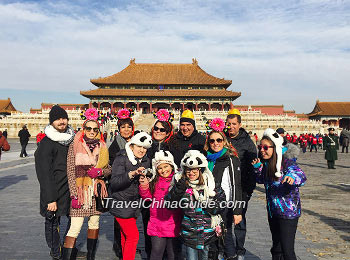 It is the world's largest urban square in the heart of Beijing and has witnessed important ceremonies and assemblies. Then, you will walk through the Tiananmen Tower with the company of our guide to visit the Forbidden City, which was the royal palace for 24 emperors during the Ming and Qing dynasties (1368 - 1911). At noon, an a la carte welcome lunch (valued at CNY150.00 per person and included in our price) will be arranged at an elegant restaurant, where you will also taste the authentic Peking Roast Duck. 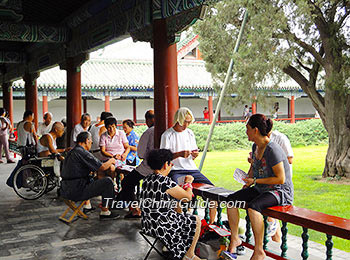 After a short break, you will be escorted to the Temple of Heaven, where emperors held national sacrificial rituals and prayed for good harvest in the old times. If you are a big fan of Chinese Kung Fu, a lively Kung Fu Show at the Red Theater will offer you a chance to appreciate this martial art up close. This morning, we will arrange a visit to the Mutianyu Great Wall, and the round-trip cable car is included. Connecting Juyongguan Pass in the west and Gubeikou Great Wall in the east, Mutianyu has been regarded as an important military area in Beijing since ancient times. Afterwards, to celebrate the conquest of the Great Wall, we will specially provide red wine for a group-toasting. Lunch will not be arranged by us as restaurants near the Great Wall are not up to our service standard. You may have a big breakfast before setting off and have some fast food around the scenic area. Our guide will offer you more advice. On the way back to the downtown area, we will stop and leave you some time to take photos of the Olympic National Stadium, also nicknamed as the Bird's Nest because of its unique appearance. 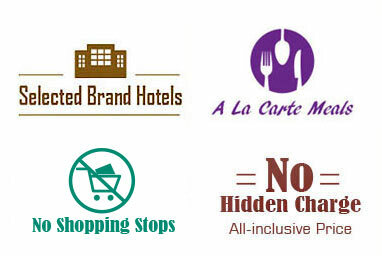 Afterwards, take your time to explore a featured local market and get relaxed. Having had a challenging trip yesterday, this morning we will arrange a leisure visit to the Summer Palace, which used to be the royal resort during the Qing Dynasty. Here you can admire richly ornamented halls and temples, the tranquil Kunming Lake and Longevity Hill. Then a Hutong exploration by rickshaw will round off your Beijing tour. You can have a glimpse of authentic traditional Beijingers' life while shuttling among Hutong alleys and grey brick courtyards. Furthermore, a special Chinese Paper Cutting experience is also in the schedule. At noon, we will provide an a la carte lunch (valued at CNY150.00 per person and included in our price) at a fancy restaurant. After that, you will be escorted to the airport for your onward flight to Xi'an. Upon arrival, our local guide will pick you up at the airport and accompany you to the hotel for check-in. Your memorable Xi'an tour starts today. After breakfast, our guide and driver will pick you up and transfer you to the Terracotta Army. It is the funerary object of Emperor Qin Shi Huang (259 - 210 BC) with over 8,000 pottery soldiers and chariots in battle array to protect this great ruler in his afterlife. After that, we will have an a la carte lunch at a local family (valued at CNY120.00 per person and included in our price). You can even follow suit with the hospitable host to cook home-made food if interested. After lunch, our guide will take you to Jianfu Temple to visit the Small Wild Goose Pagoda and Xi'an Museum inside. The Tang Dynasty Music and Dance Show will highlight this evening and you will be served a traditional Dumpling Dinner at the same time. In the morning, you will be taking a short ride to the City Wall Park. While strolling in the park, you will see a great many of local people are doing their morning exercises. It is the best place for you to get to know more about the local life and feel the culture differences between east and west. You will also experience a Tai Chi practice with the master whom we specially invite. 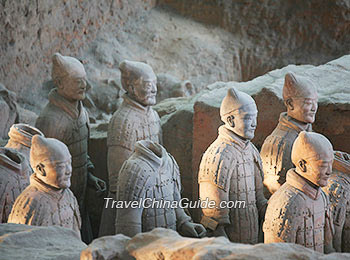 Then under our guide's company, you will ascend the City Wall, which has guarded the old city of Xi'an for over 600 years. If you are interested, you can go cycling on the wall. The bike rental fare is your responsibility. After an a la carte lunch (valued at CNY120.00 per person and included in our price) at a well-known restaurant, our guide will transfer you to the airport for your flight to Shanghai and help you with the boarding procedure. Upon landing, you will meet our local guide at the airport exit and be escorted to the hotel by a comfortable drive. After breakfast, our guide will pick you up at the hotel and take you to the first destination, Shanghai Museum. The museum collects over 120,000 precious items of different dynasties, among which bronze wares of the Western Zhou Dynasty (1046 - 771 BC) as well as paintings and calligraphy works of the Tang Dynasty are the most worth seeing. You will then be transferred to Yu Garden. Although not very large in scale, it resembles an elaborate bonsai with pavilions, bridges, pools, and rockeries inside setting off by verdant plants. Our guide will leave you some time to hang out at the traditional bazaar nearby. At noon, an a la carte farewell lunch (valued at CNY120.00 per person and included in our price) will be arranged at a popular local restaurant. After lunch, we will drive to the Former French Concession to appreciate the exquisite western-style garden houses and know about the histories and stories there. 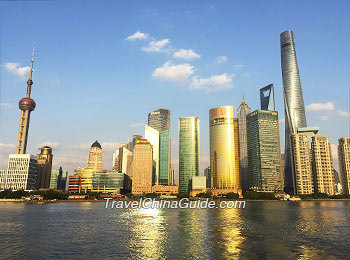 Our next destination is the Bund area, where you will take a one-hour cruise tour along the Huangpu River. You will also have time on the Bund to look at the miniature of Shanghai back in the 19th century. Our guide will accompany you back to the hotel at the end of the day and say bon voyage. This one-week China small group tour will come to an end today. Take your entire belongings to check out the hotel and get to the airport for your homeward flight by yourself. In order to save your time, we kindly suggest you take a taxi to the airport. It is around CNY150 per cab to Shanghai Pudong Airport (PVG) and CNY 200 to Shanghai Hongqiao Airport (SHA). Please make sure you go to the right airport. We wish you a nice journey home! 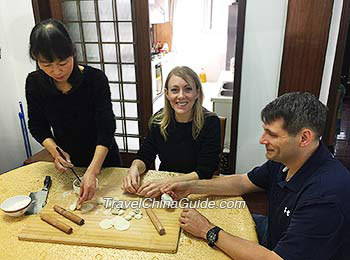 If you wish to extend your tour from Shanghai to other neighboring cities such as Suzhou, Hangzhou, Huangshan and others, please feel free to contact our travel consultant. We will be happy to arrange it for you! Prices are per person in US Dollars. I enjoyed every minute of my tour. I would highly recommend it to others. The price was reasonable and I saw many things. The guides were very knowledgeable. We have some great moments with our guides. I am happy to reassure people that TCG provided an outstanding service. This is absolutely a great way to experience China. Thank you for making China possible! This vacation has opened up a whole new part of the world to us. The quality of our experience was exceptional, and I can't imagine having done so much and learned so much without our guides. I feel that I have finally begun to feel connected to this very important part of the world! Thanks for the good service we had. All the meals we're were good. All of them could be recommended. The only negative point is sometimes, we ate at 1h30 pm and supper time was at 5h00pm because we had a show to attend. If was to close together. All the guides were nice people. A special thanks to our guide in Xi'an. She was outstanding! Cars were always clean and good service. A special thanks to our driver in Beijing and Xian. Haven't even left home yet! Selina has been prompt, informative answering my multiple questions as well as accommodating to my requests. My husband and I sincerely hope we can meet Selina in person when we arrive in China. I want to thank the agency very much for all the arrangements they made for our travel in China - my wife and I had a wonderful time, and I’m sure that we’ll come back to China within a few years. The itinerary was wonderful, and most of the guides were excellent on our trip; some guides were much better than others, but all were acceptable and it was interesting to see the variation among the city guides. Wendy, our tourist consultant, is very friendly and helpful so far.Me and my husband are very satisfied with her. She is here for us whatever we need. Very kind person, with huge knoweldge of the trip. I would like to appreciate the company for their hard work in producing an excellent experience for us. 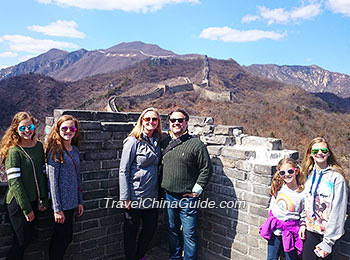 It was the opinion of all of our group that they exceeded our expectations for our first visit to China which we all universally enjoyed. The mixture of different nationalities worked very well and it was a help that everyone spoke English in the group. There was so many wonderful sites to see that it would have been nice to spend more time at the majority of them. However this is not possible, but to give you an idea of which spots might be omitted from the itinerary: personally I would be happy to drop the CPC First Congress Site from the agenda (but ONLY because it was slightly less interesting than the others, and NOT because it was disappointing). In general the meals were good or very good. It is so difficult to remember the really good ones, especially as I enjoyed so many of them. My one strong suggestion would be to see if it was possible to have LESS food during the lunchtimes as very often we felt that there was too much food provided during the middle of the day. We enjoyed the rest that the lunch break provided, but less food would not have been a problem. Our Xi An guide definitely had the most strongly accented way of speaking English. She was extremely knowledgeable about all the tour spots and gave us lots of information. Because she tended to speak quickly and with a very strong accent, it was sometimes difficult to understand her. Also she tended to speak for 5-10 minutes at once delivering lots of information, but too much, it would be better if she delivered her extensive knowledge in smaller pieces of 3-5 minutes each - this was done by David who had a wonderful way of delivering information, even though his English was good, but not as good as Rai, our guide in Shanghai.